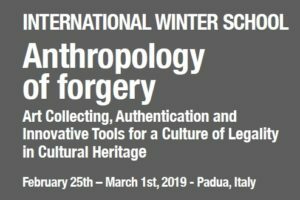 The International Winter School “Anthropology of forgery. Art Collecting, Authentication and Innovative Tools for a Culture of Legality in Cultural Heritage” will continue exploring the topics first presented in the first Winter School, titled “Anthropology of forgery. A multidisciplinary approach to the study of archaeological fakes” and held in Padua, Vicenza and Venice from February 13th to February 17th, 2017.